As a creative, stable and above all fun way of combining audio loops in real time, Ableton's Live has proved an ideal counterpart to Rewire-compatible applications such as Cubase. With version 4 offering a wealth of new features including MIDI sequencing, could it now replace traditional sequencers altogether? In their company profile, Ableton co-founder Gerhard Behles describes the idea of Live as software that provides musicians with a 'studio as instrument' — a concept that many of us from the era of dance music are very familiar with. The way they have gone about implementing this concept in fact incorporates a lot of the methods '90s dance music has developed since the arrival of the S900 and the Atari computer. Live is essentially a hard disk-based audio player and recorder that takes advantage of today's fast processor speeds and disk access times, and combines them with some blistering time-stretch ('warping') algorithms to deliver what can only be described as an astonishingly fast, innovative and intuitive tool to compose, arrange and play music. It allows musicians to combine almost any audio, be it on their hard disk or recorded from scratch, with anything else, virtually 'on the fly'. You can audition material from hard disk alongside running program sequences, drop in live overdubs that can be triggered back off disk in an instance (remember 'Frippertronics'? ), change tempo while all this is going on, and a lot more. All of this can be done mixing most common file formats, sample rates and bit depths for maximum flexibility and speed. Much of the basic functionality was present in version 1 of Live, but Ableton have extensively developed its automation, audio processing and interface facilities through releases 2 and 3. Version 3 saw the introduction of envelopes for manipulating audio data, with the facility to copy and paste envelopes between parameters speeding up the process of creating more complex automated tasks considerably. Building on their intuitive basic interface, Ableton have added functions such as keyboard and MIDI triggers for audio clips as well as scene-based automation. Facilities such as the legato mode allowed users to superimpose melody on to audio via MIDI keyboards, or create unique grooves by switching between loops part-way through. This intuitive interface convinced a lot of people in the performing arts to start using the software, with modern dance and theatre companies now being able to perform live to music that was being created 'on the fly' while providing a reliable time base (if desired). Mixing and audio processing, meanwhile, was enhanced by introducing more proprietary plug-ins such as compressors, more sophisticated DJ-style EQs and creative effects like the resonator, which generates harmonics around a chosen fundamental note and is useful for both percussive and atmospheric sounds. VST handling is possible from multiple editor windows and the managing of sounds and banks is comfortable, with a logical filing system. 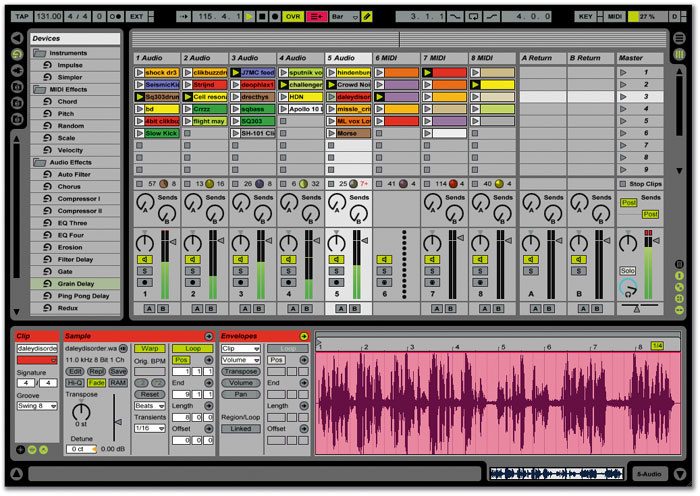 From the basis of the solid 'audio sequencing instrument' that was version 3, Ableton have launched Live 4, which is now described as 'real-time music production' software for Mac and PC. Version 4 introduces MIDI sequencing for the first time, along with Ableton's own plug-in instruments, the appropriately named Simpler and Impulse sample players. Apart from the MIDI sequence editing facilities (which I will look at in more detail later), MIDI clips are handled in much the same way as audio, being stored as MIDI files that can be dragged on to the control surface into clip slots for instant combination with any other material running in the application. VST and Audio Unit instruments are supported, so that the user has access to his/her existing library of sounds in these formats. External MIDI I/O is also supported via the usual interfaces. I have used Live live on several occasions recently, and its simplicity, reliability (the only real crashes I had throughout the reviewing period were Rewire-related, in complex situations with Logic running as the host under heavy CPU load) and overall ease of operation make it the ideal tool on stage. The fact that scenes can now store tempo information opens up a whole new application for the software: triggering loops and any additional backing tracks for bands, since each song can be stored as a scene, providing multiple outputs for headphone feeds and so on. For this I would recommend it to anyone who needs a light and robust tool for showtime. The beauty of using Live in this fashion is that you can now store the tempo in the scene title, which means it can be changed on a nightly basis as the set develops. Nothing is more annoying than having to re-record the backline sequencing on tour because it needs to be sped up by a couple of bpm, and this is precisely what you have to do if you are using traditional hard disk systems or tape-based media. Ableton specify their minimum requirements as any G3 Mac or faster with at least 256MB of RAM, running OS 9.2 or later or Mac OS X 10.1.5 or later; for Windows, the software requires a 400MHz CPU or faster with 128MB RAM, running Windows 98, 2000 or XP. As usual, PC users will also need a Windows-compatible soundcard, preferably with Direct X or ASIO drivers. With a program such as Live there's limited point in running bench tests of the 'how many plug-ins can the software run on how many tracks while standing on its head before crashing' variety, because the goal here is creative manipulation of audio files rather than simple multitrack playback. However, Live 4 is a processor-intensive application, and anyone coming from 'traditional' HD recording systems should not expect to be able to run the same number of tracks simultaneously as on their other DAWs. A closer look at what Live is actually doing makes it easy to see why this should be so, since most functions in the audio domain are related to real-time time-stretching, or 'warping' as Ableton prefer to call it. And this is offered in the same form by no other application for Mac or PC I know of. Installation could not be easier: starting from a free demo download, you simply drag and drop the folders onto your destination hard drive, which installs all the relevant elements into their respective folders. As normal with audio applications, you have to point the software towards the audio hardware by putting the necessary drivers into the usual folders. Since Live is VST-compatible, you might also want to put a copy of your VST plug-ins folder into the Live folder. I found that this is a more reliable method than just pointing it towards an existing VST folder using an alias (in fact this caused all sorts of problems with my existing Logic setup, resulting in the corruption of the Logic preferences). Audio and MIDI defaults are set in the Preferences dialogue once the software is up and running, along with the record path, default file format and resolution. When these steps are taken you can launch Live, which will open up with a dialogue asking you for the serial number, or alternatively give you the option to run in demo mode. Demo mode does not allow you to save a set, or render to disk, something that quickly becomes very annoying because you are very likely to come up with something you'll want to save in a very short time. Once you have purchased the software, the startup dialogue responds to the serial number by issuing a challenge code (generated from the serial number and your CPU identity), which in turn will be used by Ableton to issue an unlock code. If your machine is on-line this happens automatically and takes a couple of minutes; if not, it can be entered into a form on Ableton's web site from another machine. All in all the process is very quick and painless, and you are working with your new toy well within 10 minutes of opening the box. Live comes with a single-user multi-platform licence, which means that you are allowed to use your software on only one machine at a time, but you are allowed to install it on more than one machine. The user interface has been kept simple, and in version 4 there are still only two main windows at your disposal. You can toggle between the Session and Arrange views using the Tab key, and these main display modes have in common all the other displays, such as the browser, clip views, plug-ins, and so on. The bottom left corner of both screens houses the 'info view' help text that explains whatever the mouse is pointed at at any one time and virtually makes the manual redundant. Most elements of the screen can be optionally switched on and off, but the default layout is a good starting point for anyone beginning to explore the application. To the left of both views is a browser which gives the user access to up to three different favourite locations (for example, two different dedicated audio drives and your sample library) as well as the Ableton plug-in folder and any VST folder you might have defined in the preferences dialogue. The top bar in both pages hold the transport, locator and tempo controls, all self-explanatory, clearly labelled and along long-established conventions. Live 4 comes with a well-written manual which is easy to understand and comprehensive. While trying to stay entertaining and brief enough to hold the impatient would-be-producer's attention it does, for example, go to the trouble of explaining in detail the phenomenon of latency and its significance to recording. It offers a step-by-step procedure for setting up your 'overall latency settings' which is very useful in order to fine-tune your system when you're recording live audio and monitoring through the computer. I have found that other manuals often leave out this kind of detail altogether or get lost in technical jargon that is hard for the novice to understand. Also to be found in the box is a CD of ready-made loops from Big Fish Audio containing all sorts of goodies for fans of prefab music, sorted into categories such as Bass, Drums, Horns, Percussion, Synth and Miscellaneous, the latter consisting mainly of scratching and vocal snippets. The quality of these sounds is good, and it's very easy to build an instant track using them — a good way of demonstrating the power of the software, though anyone who builds their entire tracks on the bundled samples can probably only be classified as a sad case! The Session view looks like a traditional mixer page at first glance, and this is indeed part of its function. However, above the usual mixer controls is a section of 'clip slots' into which audio and MIDI files can be dragged from the browser. Once these clips are in place, their playback parameters can be set in the clip view below. Each track defaults to having 20 clip slots, though any number can be added, and can play one clip at a time. These clips are, in a sense, sitting dormant, waiting to be activated through mouse clicks, MIDI or keyboard triggers. It is the fact that an audio/MIDI arrangement can virtually be played from a keyboard in this way that makes Live so different from normal hard disk recording systems. The trigger quantisation can be set individually per clip (from 32nds to once per bar in doubling increments) or from the global quantisation parameter, which resolves triplets as well and goes up to every eight bars. In the global menu we also find a 'no quantise' setting. The Session view provides mixing facilities, but also allows you to prepare clips for triggering via MIDI or using the QWERTY keyboard. 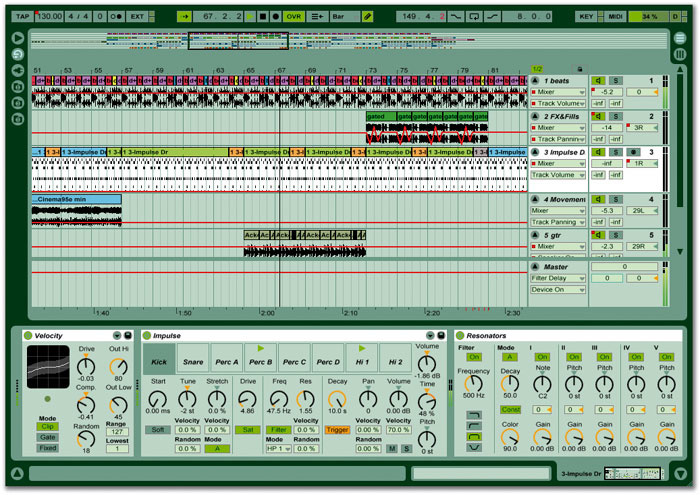 At the bottom of the screen is the clip view, where parameters for individual audio and MIDI clips are adjusted. An interesting new feature in version 4 is 'follow actions', which essentially allow you to predetermine what should happen in this row of clip slots once a clip has been triggered. You can set a time in beats and bars that determines how long the clip plays for. After that the clip will do one of the possible actions that can be selected in a pull-down menu: go to the next or previous clip, go to the last or first clip of the group, play the clip again or stop it, or go to any (random) clip in this group. A group in this context is a column of clip slots that are separated from the next group by an empty clip slot. There are two follow-on actions per clip, and you can set the probability of each happening compared to the other. This sounds a lot more complicated than it actually is, and playing around with these settings generates more or less subtle variations on repetitive patterns that would take ages with conventional beat-slicing methods or MIDI editing. Another use for this function would be the creation of nested loops, which can be achieved by cleverly combining follow-on actions with varying start points in separate clips, using the same piece of audio. I'd imagine this to be very useful for DJs wanting to create extended mixes of tracks. Live 4 offers two samplers, Impulse and Simpler. As the name suggests, Impulse is a drum/percussion sampler, which allows eight samples to be loaded at a time. 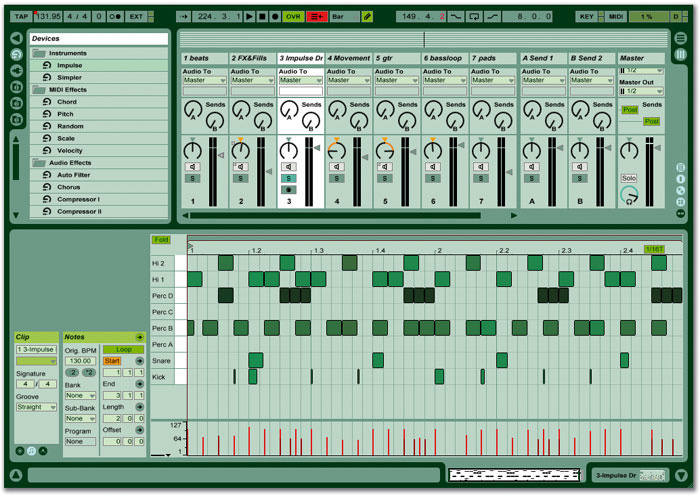 The interface is simple and intuitive, using drag-and-drop to assign samples from the browser and featuring a set of controls for each sample. There is a resonant filter, plus drive and tune functions, with additional controls including sample start and decay. Velocity can be set to control volume, tuning, filter and stretch settings. Again the simplicity of the device is very much in line with the overall design philosophy behind Live, and it has to be said that this is a very effective little sample player. A new sampler instrument: Impulse. Live does not provide a sample editor, and although most people probably have a stand-alone application like Peak for this purpose, I did miss it at times, especially when my ASIO driver would only allow for one application to address the audio interface. Shutting down the application in order to load Peak, which then has to be shut down in order to return to Live, seems rather a palaver if all you want to do is extract 2ms worth of noise to use in a sampler. However, you will encounter the same problem with a number of programs, such as Reaktor, and it's not a problem in OS X. Each instance of Simpler will only play back one sample at a time, but it provides more sophisticated sound manipulation, such as an ADSR filter envelope, key tracking, sample looping and an LFO which is assigned to pitch. This is obviously designed for melodic or pad sounds, but don't throw out your copy of Reaktor just yet. Since Live supports VST, AU and Mach-O (watch this space) plug-ins there is a lot more potential in the MIDI department then meets the eye. And, it has to be said, no sequencer application gives you all the sound-generating facilities you'll ever need. There are also a number of MIDI effects, including one for rescaling incoming MIDI notes in order to make shifting the pitch easy, a chord effect which builds up to six notes around any incoming note, and a self-explanatory Random device that works on pitch. The Velocity plug-in looks and acts like a sophisticated compressor with a random element thrown in — very slick! These effects can be dragged very much like audio plug-ins into the signal chain prior to the MIDI instrument, with the audio plug-ins being inserted post-instrument. The arrangement chooser looks very much like a conventional desktop hard disk recording package, but it still integrates all the same functions as the Session view. The main difference is that it is used for a more off-line approach, in the way that you might use a Pro Tools setup with copy and paste functions to assemble loops into a structure. It still allows you to trigger audio using the same sources, but it renders the results visually in the more conventional horizontal track view we all know from other packages. This mode could be used to construct a track from scratch by dragging and dropping parts from the browser onto the track slots, or to fine-tune and edit a performance that was created using triggers. It also allows us to superimpose more linear graphic envelopes that don't repeat with each trigger of a sample as they do in the Session view. Another, obvious reason to use this view is to copy and paste, cut and generally mess with an arrangement. On the subject of copy and paste, though, there were a couple of situations when I was the Arrange view and I had worked on a section in detail using envelopes in the clip view, but then wished for the possibility to paste them back into the Session view. This doesn't seem to be possible, and would be on my wish list for further updates. Live calls the pieces of audio or MIDI data used in a session or arrangement 'clips', and in order for clips to work in the context of a Live arrangement they have to be prepared in the clip view, which — like the effects and instrument editing pages — uses the lower section of the Session or Arrange page. Here, we decide how a piece of audio is being triggered. There are four launch modes: trigger, gate, toggle and repeat. Trigger is what is also known as 'one-shot' in the world of sampling, whilst gate plays a clip for as long as the key is held down, toggle uses one key-press for on and the next for off, and repeat plays the looped clip until another clip is triggered in the same track. For audio clips, the clip view shows a waveform display, and is where playback parameters such as 'warp mode' (the type of time-stretching algorithm that is most appropriate for the job in hand), level and tuning can be set. A clip is more than just a bit of audio, though, since it can be prepared for playback in the clip view in a multitude of (non-destructive) ways, setting a host of playback parameters such as pitch, trigger points, panning, levels, warp modes, warp markers (which can be thought of as quantisation anchors within a piece of audio, corresponding to slice points in an application such as Recycle) and even the grain size of the time-stretching cycles over time (interesting for textural variation), with the aid of controls as well as envelopes. This way, the same piece of raw data can be made to sound completely different without the need to create a new audio file, and the variations are virtually limitless. A nice feature is that the length of the envelopes can be decoupled from the sample length, in order to have variations in the envelopes over multiple cycles of the sample. This way a one-bar audio loop can be turned in something more interesting using envelopes that repeat over a longer period. Since there is no need to render each variation to disk, Live is very efficient in terms of hard drive load. For some more extreme manipulations, and when doing a lot of crazy warping to a lot of material, it becomes necessary to switch clips to RAM mode, which stores them in RAM ready to be triggered, thus reducing disk traffic and CPU load. This is a very useful function introduced with the release of version 3. Mixing and routing is handled in the Session window. The mixer part of the Session view has undergone a significant revamp since version 3 and allows for more complex routing. Audio channels can get their signal from a number of sources such as the individual outputs of Impulse or any other multiple-output plug-in, other audio channels for subgrouping purposes, the master out for resampling, external sources, and so on. This routing is done via the In Out section of each track and in general works very well. One aspect of the mixer that caught me out is the solo/cue button. By default, solo cuts all other signals and sends the selected track to the main output, which is quite restrictive, meaning that you cannot switch a number of tracks into solo mode together, and you never hear the effect returns when in solo. However, this behaviour can be changed by disabling the Solo Exclusive preference, whereupon any number of solo buttons can be activated and these signals are all mixed together. Alternatively, the Solo Exclusive preference can be overriden by using the Command (Mac) and Ctrl (PC) modifiers when soloing multiple sources. This works fine but I still feel that there is room for a couple of improvements: when multiple signals are routed to a group track both the source and the group track need to be in solo in order to hear anything, and the same applies when you want to listen to a signal with its aux effect. A real solo-in-place configuration would be more comfortable in this case. Conversely, if you want to hear only the Aux return you need to solo it with the source and then lift that from the mix buss, and listening to just a group return entails selecting solo on all its sources as well as the return channel. I feel that a true PFL mode would be the more efficient solution. The MIDI routing works along similar lines to the audio, with the inputs and outputs of each track effectively functioning like a patchbay. This I found an elegant resolution, which makes doubling up MIDI signals to two sound generators as easy as sending multiple MIDI tracks to the same sound source. It is also possible to bounce several MIDI tracks together in this way, but interestingly this is the only way of combining MIDI tracks destined for the same sound generator. There is something to be said for the good old glueing tool to do this job, since that doesn't have to be done in real time. New to version 4 of Live are MIDI clips, which are handled in a similar way to their audio counterparts, with the clip view offering some of the same parameters such as volume and pan, plus MIDI-specific parameters, some of which depend on the sound source. MIDI clips can be created by playing in MIDI from a master keyboard as with any other MIDI sequencing software, and you can draw the notes into a keyboard-matrix-style window that looks familiar, too. You can also view Standard MIDI files in Live's browser, and import individual parts from them as MIDI clips. The clip view for a MIDI clip in Live 4, showing the MIDI editor. Ableton's design philosophy of simplicity and instant gratification certainly comes into full force here, and they have improved on some aspects of traditional MIDI editing windows. I like the way the pencil tool acts as an eraser when you click on a space that's already taken — why should you have to switch tools for such an obvious task? Also very cool is the way the grid resolution and quantise/drawing resolution can be changed with simple keyboard shortcuts. The 'fold' button is also worthy of mention: this condenses the display matrix to show only the MIDI notes that are actually used in the clip, thus reducing scrolling up and down to get to two adjacent notes that might be a couple of octaves apart. Notes can be selected in all the usual ways, including rubber-banding the mouse over an area of multiple notes, or shift-selecting them individually. It is also possible to click on the field to the left of a row of notes and select all notes of the same pitch, which is useful, especially when you want to adjust the overall level of one drum sound in a part while retaining the dynamic variation between individual hits. MIDI controllers are manipulated using the envelopes, which can be drawn in using the pencil tool from the main control bar. Despite Ableton's claim to have developed a completely new way of handling MIDI, though, it has to be said that it is hard to completely reinvent a format so well established, and as a user of Logic who is used to having at least two simultaneous displays, I find Live 4's MIDI slightly on the frugal side. I really do miss having some numeric information about position, velocity and so on, since purely graphic manipulation is not my thing. But this is a personal choice, and I know plenty of musicians who would say the opposite. Put it this way: it is hard to imagine Sir George Martin doing his next orchestral arrangement using Live, but then again I don't see him scratching beats either. Live's MIDI is great for simple, pattern-based music such as is found in most dance styles, while people who want to be able to approach the subject from a more musicianly point of view will want to stick to Sibelius or Logic. They will, however, still love the possibilities Live gives them in the audio domain, and of course it's still easy to run Live as a Rewire slave to a more mainstream MIDI program. Also in the clip view section, we prepare the timing and tuning aspects of a clip. Depending on the nature of the source material Live gives you four different algorithms for the tuning/stretching of audio: Beat mode slices up a rhythmic loop in a similar way to Recycle, two other modes called Tone and Texture offer different algorithms for granular pitch-shifting and time-stretching, which suit different material, and Repitch behaves like a conventional sampler, where playing a clip back at a new tempo alters its pitch. Live's ability to time-stretch audio in real time depends on preparing clips and storing information about the transients they contain as 'warp markers'. One drawback of Beat mode is that it introduces artificial transients on hits that are longer than the selected resolution. If, for example, a loop is essentially made up of 16th notes with the occasional eighth in between, the longer notes will acquire a slight peak halfway through. This leads to audible signal degradation, depending on how extreme the time-stretching is. In some cases this can be a good thing when you are trying to create interesting sounds, but the compound effect can be quite severe, and anyone trying to achieve natural-sounding tracks needs to watch out. I found that one way around the problem is to layer stretched loops with clean samples in order to mask the effect. This effect also becomes quite obvious when dealing with clips that consist of whole tracks when these contain some non-rhythmic passages, such as ambient drops or a cappella vocals. Setting so-called 'warp markers' within a piece of audio determines which points of the clip will be quantised to the tempo. For this purpose Live writes another file, associated with the original audio file, onto disk. Having prepared clips in this way you can combine any piece of audio with any other and the software will automatically play them in time with each other. It's in this instant matching of material that Live is so different to any of the other software around. Even when auditioning clips from disk that have not been made part of the session in the browser window, Live will play them back in time, provided they have been truncated and warp-marked at some point. If they have not been prepared the software takes an educated guess, which sometimes works if the sample has at least been cut to the nearest bar. Apart from the DJing applications, these features make Live a very powerful composition and beat-generating tool as well. In the so-called legato mode, for example, all loops get triggered at the same time, and switching from one clip to another in this mode means that playback switches from one clip to another mid-bar rather than retriggering the new loop on the downbeat. Combining a number of drum loops in this way makes Live a great groove-creation tool. Another welcome addition to the feature list in Live 4 is the swing function, which globally adds swing in percentage points to all MIDI clips and audio that has 'warp' enabled and isn't set to Repitch mode. Unfortunately Live still doesn't allow for user-built groove templates, but compared to the options available in previous versions (straight quantise or no quantise) this is a vast improvement that in all fairness will be good enough for most situations. Loops with an inherent swing need to be straightened out first (by setting the warp markers to each swung hit), because otherwise there will be a compound effect when you apply additional swing. While we're on the subject of new features, Live now allows for reverse playing of clips by writing temporary files onto the hard disk. Live supports VST and Audio Units plug-ins, and also includes a selection of proprietary effects. Once all your clips have been set up, they can be triggered using either MIDI and/or the numeric keyboard. Using the Key Map Mode and MIDI Map Mode switches it is very easy to assign trigger sources to clips. Apart from the above-mentioned launch modes there is also the legato setting in the clip view, which allows the player to vary the pitch of a clip during playback — if you like, superimposing a melody onto a piece of audio that is continuously playing. The RAM play option comes into its own here because it cuts down the latency and allows for smoother disk handling, which greatly increases the overall performance. With a combination of alphanumeric key strokes and a MIDI keyboard or controller set up to trigger parts that require more dynamic and/or melodic modulation, Live thus becomes an 'on the fly' arrangement tool. It is in this area that dance companies and more adventurous DJs get a lot from the package. Another way of assembling an arrangement very quickly is to prepare a number of combinations horizontally across all the channels that then can be triggered as a scene using a single master switch. In a way this is the opposite of creating arrangements using mute groups; you are, if you like, using 'play groups'. Again, this can be extremely useful when working on an extended arrangement on the fly, or in the context of a live set where you need the timing of a machine combined with the flexibility to improvise structure. With the 'capture scene' command you quickly build up a complex set of arrangement sections that can be triggered instantly via MIDI, all on the fly, without stopping the music once. With the global Record button enabled in the main transport bar it is possible to record any such performances on to a more conventional sequencer layout: all the different triggers from all the clip slots in a track will be recorded and displayed on a track in the Arrange view. If you have a MIDI control box connected and assigned to any of the parameters, the global Record switch allows you to record your automation. Any data added in subsequent passes replaces the original, which is a clean and effective way of storing automation. What sets Live apart from all other audio packages is its immediacy: it really feels more like an instrument than a sequencer or recording system. It has a highly intuitive interface and, in its simplicity, is the ideal tool for musicians who want to have a performance-based computer system. I found Live 4 to be very stable on both Mac OS 9 and OS X, and I would therefore not hesitate to use it in a live situation. Although the newly incorporated MIDI editing capabilities don't offer the same depth as their counterparts in more conventional sequencers, Live 4 puts a different spin on MIDI sequencing that can open up new ways of working. Above all it's great fun to use and absolutely belongs in any creative music environment. An incredibly fast way of throwing together audio from diverse and different sources. Innovative, performance-based approach to writing and arranging loop-based music. Very stable and reliable, good for on-stage use. Well designed, intuitive, easy-to-understand interface. Solo function would be improved by true solo-in-place and PFL modes. With the introduction of MIDI and the two proprietary samplers, a sample editor would be useful. Live 4 is an intuitive audio and MIDI sequencing application that opens up a different and exciting new dimension to hard disk recording. £299 including VAT; upgrades from all older versions £99 (boxed) or 119 Euros (download).